A typical highly productive “selector” uses a voice pick system that directs the robot to a pick location, where he selects the case and solves the three-dimensional puzzle to build the pallet – at a rate of 150 cases per hour, driving over a mile in the process! What are the major economic drivers behind the need to automate the warehouse and how has robotic technology evolved to where it is today? For many supply chains, such as food and general retail, only one-sixth of the cost of delivering products to customers is raw material and manufacturing. The balance is distribution and delivery including costs for labor and transportation at each step. These costs, which include fuel, medical, workers comp – are all rising faster than the rate of inflation. At the same time, the number and diversity of products (or SKUs) is increasing, stressing the capacity of warehouses and traditional automation. Robotic technology until recently was applied mainly upstream in product manufacturing and packaging where the number of different products handled is much less. In warehouse distribution, robotics has been applied to sectors such as beverage with around 500 SKU’s in a typical warehouse and with a limited range of product dimensions and weights to handle. What is unique about Symbotic's approach to automation that is different from its predecessors? Symbotic has developed disruptive technology in the form of high speed, highly coordinated autonomous mobile robots, or rovers. Traditional approaches to warehouse automation typically used cranes operating in fixed aisles, connected with large networks of conveyors. Most automated warehouses store products on pallets or as single cases, but fixed cranes can only access one or a few in the aisle at a time. In contrast, in the Symbotic MatrixSelect system, Matrix Rovers freely move through a three-dimensional structure, accessing products at all levels and aisles at the same time. Another important function is sequencing. In most applications, products need to be selected in a desired order – in exact sequence if being fed to a palletizing robot, or close to exact sequence for dense loading of trucks, or grouping products together for packing into a single customer order. This is where traditional automation needs networks of conveyors or complex sortation systems. 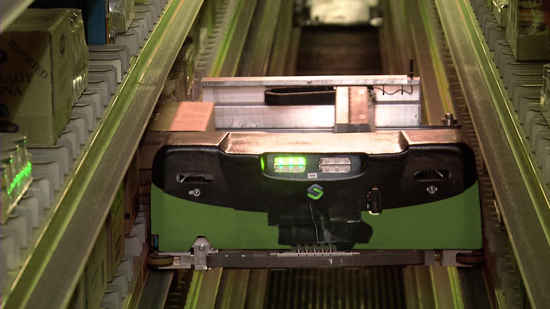 Symbotic eliminates the need for this costly and space-consuming equipment by sequencing in software, by tightly coordinating the movement in the rover fleet. Why do customers choose Symbotic? Where is it driving performance increases and/or reducing capital costs? Capital cost, operating cost, density, and ease of installation are the main differentiators based on feedback from customers. The advanced technology in MatrixSelect is mainly in the rovers and software with the balance of the system mainly a simple rack structure for storing products. As a result, the capital cost is much lower than traditional automation which employs complex equipment throughout the structure. In many cases, traditional automation requires a dedicated new building further driving up capital costs. MatrixSelect can be retrofitted into existing buildings, with the added benefit of faster deployment and allowing customers to maintain favorable locations in their transportation network. Operating costs are also much lower than competition, since maintenance is mainly for rovers which can easily be removed from the structure. Overall, MatrixSelect has hundreds fewer moving parts, motors, sensors, wires, etc., compared to traditional automation. Finally, MatrixSelect offers the highest storage density of any automated warehouse solution. Compared to other approaches, it stores cases directly on shelves rather than using trays or totes, which are themselves costly and always larger than the products themselves. What are the different applications in a warehouse that require automation to improve its efficiency and/or performance? Following the process flow in a warehouse, manual operations include transport from receiving and loading of inbound pallets to pallet racks, moving pallets from racks to picking locations, driving fork trucks to picking locations to select products, building, wrapping, and labeling the pallets, with delivery to the shipping dock. MatrixSelect fully automates all process steps from receiving to shipping. A typical highly productive “selector” uses a voice pick system that directs him to a pick location, where he selects the case and solves the three-dimensional puzzle to build the pallet – at a rate of 150 cases per hour, driving over a mile in the process! Since this a high-turnover job, selectors with less experience have lower productivity. Not only does Matrix selection perform the put-away and pick process steps, Symbotic has also developed proprietary “puzzle software” enabling robots to build complex pallets up to eight feet tall with dense loading of shipping trucks for lower energy costs. Can you describe a typical warehouse automation project and how the process affects the existing operation during implementation? Implementation of the MatrixSelect system has limited impact on existing operations. Typically the customer identifies the area to be used and removes existing storage racks. MatrixSelect dimensions and layout are flexible, so modifications to building structure are limited. Ongoing warehouse operations continue unchanged. Matrix Select software uses an “application layer”, facilitating the interface to the customer’s existing IT warehouse management software. Kiva Systems was a mobile robotic technology using software that was recently acquired by Amazon. How does the Symbotic solution compare to Kiva? Kiva has done an excellent job in developing new technology and applying it successfully. Like Symbotic, it uses disruptive autonomous mobile robots. But there are major differences. The Kiva system is aimed at handling of relatively small items that can be stored on mobile shelves. The robots tow the shelves across the floor, so it is essentially a two-dimensional system. The MatrixSelect storage structure is three-dimensional, making use of the full height of the building. Despite the complexity of the 3D layout, Symbotic achieves much higher transaction rates through its high speed rovers and exact sequencing software. Finally, the MatrixSelect Rovers are not just “tugs”, but directly handle the cases, totally eliminating human handling. Where in the supply chain and/or in what particular industries are looking to apply similar robotic technologies? The initial application for the technology was wholesale grocery which handles over ten thousand different products in a typical warehouse with large diversity in dimensions, weights, and packaging types – all of which make automation a challenge! The next application area addressed was general retail - again with a large number of diverse products to store and handle. As more customers become aware of the technology, they are bringing their applications to us which is exciting. However, we want to make sure we understand new markets and requirements carefully, so assure the highest quality project execution. How will the future of warehouse automation unfold over the next 5 to 10 years? Are new technologies around the corner? Are costs going to drop or is market penetration the primary goal? Symbotic is still a new company so clearly costs will go down with increased volume and performance will go up as we optimize the system. New technologies for sensing and manipulating with allow rovers to handle products with more complex shapes, expanding market opportunities. As Symbotic’s Chief Technology Officer, Larry focuses on the development of next generation technologies driving new product development and leading the software engineering team in transforming innovative concepts into market-ready products. Larry builds on over twenty years international experience in development and implementation of advanced automation technologies. He has held senior executive positions for ABB, United Technologies, Pepsico, GE and its joint venture with Fanuc. He developed patented robotic systems that received best product of the year awards from Toyota Corporation and Research & Development Magazine. A graduate of MIT and the University of California, Berkeley and building on his prior roles on the engineering faculty at Princeton University and contributor / ediotr to robotics and automation technical journals, he will cultivate partnerships with leading universities and research labs worldwide. Larry has also been recognized for operational leadership, with awards from Industry Week (his Scroll Technologies plant among ten best in U.S.), United Technologies (division asset productivity award for lean supply chain), and Carrier President’s Award for Operational Excellence (electronics manufacturing).